After years of delays, it seems Sony's Bad Boys for Life is finally back on the right track again with a new set of directors. Filmmakers Adil El Arbi & Bilall Fallah, who signed on to direct Paramount's Beverly Hills Cop 4 back in 2016, have entered negotiations with the studio to direct the third installment of the beloved Bad Boys franchise. There have been numerous starts and stops over the past 15 years, but now it seems this long-awaited sequel might actually come to fruition. The latest in the string of woes for this languishing sequel started in March, when director Joe Carnahan backed away from this sequel in March 2017, after being attached to the project for nearly two years. Then in August Sony revealed this sequel was delayed indefinitely, with the studio yanking the sequel from its November 9, 2018 release date, with Sony moving Holmes & Watson to that date. Later that month, Martin Lawrence even revealed in an interview that, "I don't think it's going to happen". That doesn't seem to be the case anymore, with Sony eyeing an August production start date. 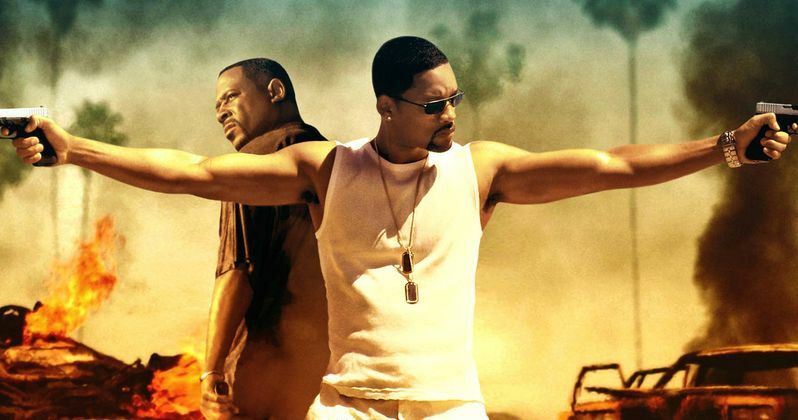 The last we heard on Bad Boys 3 was in September, when producer Jerry Bruckheimer teased in a new interview that the sequel is not dead yet, revealing that they have a new writer working on it now, which the producer revealed was an encouraging sign. This new report from Deadline reveals that the latest writer to tackle the script was Chris Bremner, who is writing the upcoming Sick Day and has had scripts land on the 2015 and 2016 Black List. No story details have been given yet, but if Chris Bremner's script is the one that pulls this project out of development hell after more than a decade, the studio must be quite happy with it. There was even talk early last year that this sequel may be cancelled due to Will Smith's Dumbo, although that isn't the case anymore. Will Smith and Martin Lawrence will return as Mike Lowrey and Marcus Burnett, from 1995's Bad Boys and 2003's Bad Boys II, but there isn't any indication if other cast members from the first two movies will be back. The timing is also rather interesting since NBC is moving forward with a Bad Boys TV spin-off, starring Gabrielle Union, reprising her role as Syd Burnett from Bad Boys II, Marcus' sister and Mike's secret lover, who also worked for the DEA. It's not clear if there will be any crossover between this sequel and the NBC series. Born in Morocco and raised in Belgium, Adil El Arbi & Bilall Fallah made their feature directing debuts with Image in 2014 and Black in 2015, the latter of which helped put the filmmakers on the map. A year after that film debuted, they landed the coveted gig directing Beverly Hills Cop 4 for Paramount, although there is no indication as to when production may begin on that project yet. They also directed the pilot episode and the second episode of FX's hit drama series Snowfall, and their new film Gangsta is slated to debut later this year. Deadline broke the news on Bad Boys For Life earlier today.